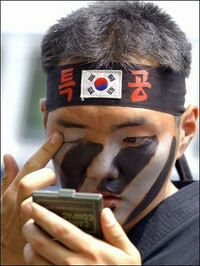 A soldier of the South Korean special attack corps paints his eyes during a friendly Taekwondo match at a South Korean Army Base in Pochon, north of Seoul. Many South Korean soldiers on guard no longer present a rough, sunburnt face to the enemy, a report said Friday. Some members of the largely conscript army "now rival women in the use of cosmetics, and some even order wigs to disguise their short hair for the vacation," according to the website of Chosun Ilbo newspaper. In a report headlined "An army of beauty queens? ", the paper said one 21-year-old it interviewed spends an average of 110,000 won (117 dollars) a month on bath products and cosmetics. Besides shampoo and conditioner, he uses toner, moisturiser, essence, sun-block and foam cleanser, it said, noting that his basic pay is only 80,000 won. "I got worried that my skin would get rough and dark after I joined the army," another soldier was quoted as saying. "If I want to meet my girlfriend during the vacation, I have to take care of my appearance. "It's not just me. Most people here use at least two or three specialised cosmetics for their skin." The report said AmorePacific, which supplies cosmetics to over 1,100 Post Exchanges (PXs) across the nation, reported that sales from January through July surged 85 percent from the same period last year. It said some in the military worried about "Generation Y soldiers obsessed with their appearance" -- but others are sanguine. "This trend is not just taking place among young soldiers but among young men in general, so I shouldn't be too worried about it," one field officer was quoted as saying.